I have heard a lot about Narendra Modi, the bad things and the good things; about Godhra and about Governance; of culpability and of capabilities.. the list is long! In today's time, when everyone around you is pushing you to make an opinion about things favourable to them, the better way is to experience and observe things on your own before falling for any fallacy. Such was a chance when I got to know that Mr. Modi is doing Google+ Hangout! The news was exciting in itself at the times when the Government is blocking file sharing websites and monitoring social networks; here is a politician on the contrary who is trying to tread upstream! When I joined the live telecast, it was more than half over. I watched the remaining live telecast first and then went through the recording of what I missed. I must admit that I was amazed at the variety of topics that were touched and the manner in which they were responded by Mr. Modi. He started off his address after Ajay Devgan gave small intro about the hangout session. The program was portrayed as a part of Swami Vivekanand's 150th Birth Anniversary Celebrations and in is inaugural segment of speech, Mr. Modi remembered Vivekanand and his dreams of making India a global power. I like the way he dreams big! When a person talked about how China has surged ahead of India in the first decade of the 21st century which belongs to countries like India and China, Mr. Modi welcomed the pain portrayed by the asker and said that this pain which we Indians have in our heart (that is: why the country is not progressing) is the real power which will help us progress. In the same question, he talkes about how India is considered as the land of knowledge and wisdom since ancient time and reminds that the present age is again Information Age and India will definitely show it's supremacy again and will work in the direction of vishva kalyan (betterment of the world). I would like to stress upon the Indian values highlighted by Mr. Modi, which not just talks about betterment of oneself (common western thinking) but for all. It's music to the ears when a leader gives importance to our culture and values. He talkes about IT revolution in India which projected India as a global force in the world stage and that feast was mainly achieved by the youth which forms the major part of Indian population at present. He reiterates the importance of channelising the youth force that the country has in abundance. He informs about a new initiative that Gujrat has taken to produce a pool of teachers on the lines of IIMs and IITs with the vision of producing quality teachers which will attract big universities and educational institutions around the world. He also tells that when Indian teachers will teach in universities all over the world, they will also take with them the Indian values and culture and will spread that in the world. This knowledge will in turn benefit the world as a whole. When hit upon by a question on secularism, he says that his definition of secularism says "keep India first". The thought feels right even in the present context. In a country having number of religions and casts, what can keep us united is the thought of keeping the nation above our religion. The thought may feel inconceivable to few but it makes complete sense. He talks about how Indian culture is secular at it's very roots. How it teaches us to think of everyone before 'us'. How it aims for Vasudev Kutumbakam and urges us to work in that direction. He says, if anybody tries to teach secularism to our country which has such cultural and moral values, it is a pure insult for us. He also says that the vote bank politics has endangered the threads of secularism in the country and the day when it will end, the world will see and understand the secularism of India. "बनने के सपने देख करके राजनीती में नहीं आना चाहिए, कुछ करने के सपने देख करके राजनीती में आना चाहिए. मैं भरोसा देता हूँ, आप कर भी पाएंगे और हो सकता है जनता आपको भी कुछ बना कर रहे." Mr. Modi talks about "rurban" concept which is the combination of rural and urban development. While replying to a question about urbanisation, he boasts of 17 thousand odd villages in the state with 24 X 7 power supply and broadband connectivity. While replying to the same question he also talks about beautiful vision of healthy competition between various districts and states of the country which will put them into expressway of growth. Mind the important lines, "सरकार का काम Fire-Station की तरह, Fire-Brigade की तरह कही आग लगी और जा कर के बुझाना नहीं है, सरकार का काम है advance में चीज़ों को समझना, advance में चीज़ों को अनुमान लगाना और उसकी व्यवस्था को करना "
While answering a question from an NRI on visa, he said, he dreams of such an developed India, to visit which Americans will have to stand in a visa queue. Mr. Modi was earlier denied visa on communal grounds and for ordinary Indians as well, going to US for work or even for study is no easy task these days. ... are few words which he speaks next in the above context. I want to highlight these with reference to the leaders like Raj and Bal Thakre in Maharashtra who cannot see beyond their backyard. I pity those leaders of states who consider their state bigger than the country and try to build a vote bank on such basis. They are like frogs who cannot see out of their well. A university student asked question on brain-drain to which Mr. Modi presented a different opinion. He said India is never deprived of talent and intellect and he presented his views in such a wonderful way that I urge the readers of this post to hear them in the video enclosed with this post (at 46:00). He says that it's good that Indians go around the world and glorify the nation they belong to by their intellect and talent. We don't need to be defensive in this case. India has a lot to give to the world. Why should we become so narrow in thought and approach that talent should not go out of India. He talks about world as a family which is well written and stressed in our sacred texts. Loved to hear this perception. The later half of the hangout, new set of people joined in and asked their questions. Mr. Modi talked about the situation of black money and why it should be brought back. He talked about how Gujrat managed simultaneous growth in industrial as well as agricultural sector. He explains how the change in agriculture has been brought by listing the measures his regime took in the past years. He also talked about his habit of sleeping less and how he manages to keep the energy levels up by practising yoga and meditation. He highlighted the contribution of Amitabh Bachhan as a ambassador for tourism in Gujrat and how he worked for it without charging a single penny. He told that tourism is given a priority in the state and many new tourist destination are being developed and new possibilities are being explored. "People who say it cannot be done should not interrupt those who are doing it". Such sentiments were portrayed by Mr. Modi in the answer to the next question which I can relate to everyday tea time chat with colleagues, few of which keep saying phrases like "sab chor hai" (everybody is fraud), "kuch ni ho sakta" (nothing can be done) etc. He said those kind of people who have such a negetive mindset cannot contribute anything and a vision and conviction is required to tread the path of growth. I happened to be in Rajasthan when the in-famous dual black-out occurred in the country due to the failure of Northern and Eastern Grids. Though it didn't effect the health of the Nation much as the power backup infrastructure is already in place at the unit level, thanks to the frequent power cuts and the electricity shortage we have; still it made headlines even in the international media who took it way too seriously! I heard it back then as well that Gujrat is only state in northern India which was entirely unaffected by the major power crises and the news was definitely impressive. In the hangout, Mr. Modi informed about the solar power projects he has started (despite having enough power), one among which includes covering of canals with solar panes (which already made news)! He was correct when he mentioned that it is necessary to explore the alternative power sources other than coal, on which Indian power sector is largely dependent. When I think of the hangout as a whole, it sometimes gave me feel that it is scripted which means that the questions and answers were pre-planned. Though the thought is debatable even inside my mind, and even if it is the truth and the purpose of the hangout is to advertise the vision of Mr. Modi, I must admit that I am highly impressed with his vision and thoughts. And if he is doing what he claims to do and does what he envisions, in future, I can definitely say that the country (or at least a state of it) is heading in the right direction. In the end, I will leave the readers with the couple of lines that "Mr. Modi" said while answering the last question of the hangout! आज गुजरात की जनता ने मुझे जो जिम्मेदारी दी है, उसी जिम्मेदारी से मैं ऐसा काम करके दिखाना चाहता हूँ ताकि मेरे देश में एक विश्वास पैदा हो कि हमारा देश भी बहुत कुछ कर सकता है! 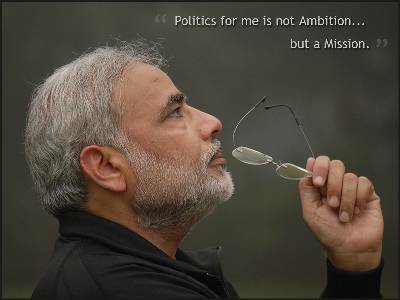 (People of Gujrat has given me a responsibility. I want to use that in doing such work for the state that generates a positive belief in Nation in the direction of growth). We Want To See You On Google Once Again. Please visit MODI360.COM to review and sign this petition.